“It’s me”, replied my mam, “how do I get rid of you”. “What do you mean get rid of me”. “How do I get rid of you”, she repeated. “Er, I don’t understand, why do you want to get rid of me”. “I’ve just switched on my mobile and your number keeps coming up. How do I get rid of you”. Breathing a huge sigh of relief that she didn’t actually wanted to do away with me, I said I’d take a look at her mobile later today. So what’s been happening in the BOGOF household. I’m still in the wars with the pressure sore on my hip. I’m at the getting rid of the dead skin stage so it’s smelling revolting. I also got a bit of as shock last week when John changed my dressing and I saw just how bad it was. Who would have though that something as simple as a tiny graze could turn into a horrendous wound. At my doctors I’m a bit of a side show as they don’t get ‘walking’ pressure sore patients. Friday was John’s birthday and the Birthday Bunny was very good to him. He didn’t have much time to ‘play with his presents’ though as we were off to Stratford upon Avon for a few days. It was the Sunderland air show last weekend and regular readers will know it’s a nightmare time for us residents when over a million people descend on us, so we decided to go away. On Sunday morning we went to the MIU to see if they could help us out. They were extremely friendly and couldn’t do enough for us. So that’s what’s we’ve been up to. Up to last night we had 48 hours of non stop rain and strong winds. Still everything seemed to be fine until I went into the kitchen to say “Hello” to Marie when she came home. As I was standing there, I felt a sharp, cold sensational on the top of my head. Yes – it was a drip. And it was soon followed by its friends, then its friends friends. I suspect the strong winds were driving the rain into the void above the kitchen. 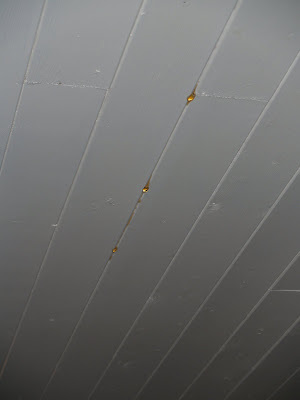 The rain would then have to make it’s way through the ceiling, and through a false ceiling before landing on top of the pine cladding that makes up the second false ceiling (Two false ceilings … yes that’s right. It’s a long story involving a previous owner and some very dodgy fake oak beams which we hid behind a layer of pine cladding). 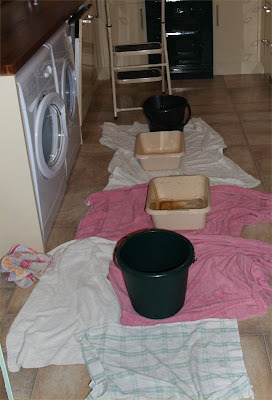 The water was coming out a dirty brown colour, and smelled very strongly of pine, so it was out with the towels and buckets until it stopped, which was about 9 pm. Still, it could have been worse. A couple of weeks ago we were away in Northampton looking at a hotel. Not a nice sight to come back to. Friday morning was my Aunt Bet’s funeral. My mam was ok, but a little bit away with the fairies. When she’s like that she can’t make decisions so I kept getting ‘would this coat be ok or what about this one’ over and over again. The same thing happened about the burial in the cemetery and the gathering afterwards – she wanted to go, then she didn’t, then she did…. We ended up going to both. I’ve got a loud squeaky hip. At best it sounds like a squeaking door. At worst it sounds like someone breaking wind…. When I was last at the hospital I mentioned the squeaky hip to the Man Himself’s sidekick consultant. He said it wasn’t anything to worry about. At a Catholic requiem funeral there’s a lot of standing and sitting. My hip was in full vocal squeaking mode so all I could hear was ‘rrrrrrrr’. It was really embarrassing. One thing I thought that was in a bit of bad taste was the council workers hadn’t removed the bright yellow digger from the cemetery while the burial took place. A few feet behind the grave was the digger, with a little workman sitting ready to fill in the hole the moment the mourners had gone. I was back to see the nurse at the doctors this morning about my pressure sore. The results from the swab aren’t back yet. The nurse has put a different dressing on it and as I’ve got to keep it dry at all times, I’m not allowed to shower or take a bath. Thankfully I have to go back on Thursday so hopefully the water ban will be lifted then. Having a rub down with a flannel isn’t quite the same as soaking in a hot bath…. So what’s been happening these past few days in the BOGOF household. I’m pleased, and relieved…, to say that the flies have gone from the kitchen. Also gone are the seagulls who were nesting on one of the rooftops near where we live. They’ve left earlier than they have done in previous years. It’s probably down to there only being two chicks to feed instead of the usual three. I’ve received my appointment to go for the MRI scan on my knee on 23rd July. It’s not at my usual hospital in Sunderland but one in South Tyneside. Thankfully John’s off work that day so he can come with me, and should the parking be as bad as it is in Sunderland, he can just drop me off, park up somewhere outside the hospital grounds then wait until I call him to pick me up. I’m in the wars again. Somehow I managed to graze my left hip. It was a tiny graze, a couple of millimeters, if that. It’s not any more… Because of my knee I have to sleep on my left side with my knee raised, (it’s the only way I can get comfortable during the night) so consequently due to the pressure on my hip, the tiny graze has now developed into a large, painful and ugly pressure sore. Just to make sure it was ok I saw the treatment room district nurse at my doctors surgery last Tuesday. She said it looked ok but wasn’t sure if it was infected. Normally she would have put some antiseptic cream on it, but as she works at a different surgery, didn’t have the authorisation to do so. All she could do was put a dressing on it and told me to come back on Friday when a nurse who was employed by the surgery could put some cream on it. That’s a blog in itself, however all I’m going to say is typical NHS ! ! ! I went back on Friday and although it doesn’t look very pleasant, the nurse doesn’t think it’s infected. She’s given me some foam plasters to put on my hip to try and cushion it when I’m lying on it in bed. I’m back to see the nurse on Thursday. I had a phone call from my mam on Sunday morning to say my dad’s sister has died. My mam and her became close following my dad’s illness. Aunt Bet was there when he died and helped my mam enormously through her grief. When my uncle died in October it hit my mam hard but I’m expecting it to be more so this time. My mam rang this morning to say her funeral is 10am on Friday, and as they are Catholics it’s going to be the full requiem mass. As you know we do like our wine. However there is one slight down side to that (other than the hangover if you’ve overindulged…) and that’s that it’s not very diet friendly. While I was on the internet I happened to stumble across a company selling non-alcoholic wines, beers etc. There used to be some really good non or low alcoholic beers on the market a few years ago so we thought we’d give the wine a try. If they were ok then we could still enjoy a bottle of wine without the guilt of excess calories or units of alcohol. We ordered a half dozen selection of reds, whites and a sparkling so we’d get a variety of the different wines. The first bottle we tried was one of the reds. It wasn’t very nice…. The second bottle we tried was a white. We decided to try this one after we’d had a bottle of real wine so we’d be slightly merry when we drank it and wouldn’t be too bothered how it tasted. To be fair it didn’t taste too bad. The third bottle we tried was another red, but different from the first one. We again drank this one after a bottle of the real stuff. On it’s own it wasn’t that good so we decided to mix it with some lemonade to make sort of a sangria. It was ok but I couldn’t drink a lot of it. We tried the fourth bottle, a white Riesling last night. Again it was after a bottle of the real thing. John tasted it first and had a pained look on his face… I didn’t get as fair as tasting it, the smell of enough !!!!! It smelt of wee. None the non alcoholic wines we tried had the aroma that normally goes with real wine, however none of them was as vile as the Riesling. The only way I could taste it was by holding my nose. It was pretty much how I imagine urine tastes. It was gross!!! We still had two bottles left so decided to have a taste testing session in the kitchen last night. The fifth bottle was another white. Thankfully it didn’t smell or taste of wee but didn’t taste very pleasant. John hit on the idea of trying some juice in them. Of the various varieties of juice we had, none of them made any difference to the horrible taste. However the taste was pretty much like the previous ones that evening. We still had some orange juice out from the previous tasting session so John made a ‘Bucks Fizz’. I’ve never tasted Bucks Fizz (I did have something similar at one of the Hull conferences - it was the one where we had to go to the Town Hall for a reception. The white wine was awful so we mixed it with orange juice) so couldn’t tell what it was meant to taste like. Somehow I think the real McCoy would taste better than what we had. I guess it won’t come as any surprise that we won’t be buying any more….